A white dove-Wings of love of Minnesota White White Dove releases for weddings , Serving minnesota, Twin Cities and Wisconsin, dove release for special events. Since the beginning of recorded history white doves have been a symbol of purity, holiness, fidelity, and love. They have been illustrated in art, recorded in literature, kept and protected in temples and palaces around the world. 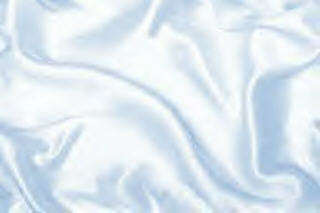 White doves play a key role in life's celebrations because of the beauty and symbolism asociated with them. For a once-in-a-lifetime experience celebrate with white doves silhouetted against the skyline. The doves are a fitting symbol for the union of a bride and groom and make the wedding celebration a memorable one. 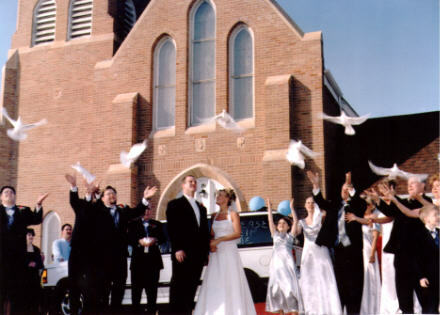 Nothing can describe the Magic Moment when the Bride and Groom release a White Dove or two into the air, while dozens of doves are released around them. Add a touch of elegance to one of the most memorable occasions in your life by releasing snow white doves. 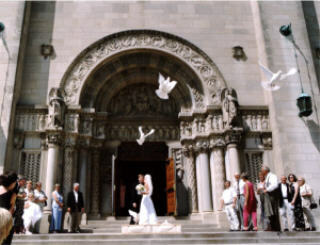 The bride and groom may each hold a dove and release them together symbolizing the beginning of your new life together. It is really a beautiful sight to see a whole flock of white birds take to the air and a few seconds later the other two doves join them. The birds circle gracefully only to disappear into the clouds. The look of delight and surprise on you guests face is truly a joy to see. Wings of Love also has a decorated basket that can be used for a release. We will bring the birds to you on your wedding day. We will show you how to hold the doves. We will also take care of collecting the baskets and cages. Doves are environmentally friendly and they will return safely to their home. Most churches no longer allow rice or balloons. What a touching site to see, the newlyweds give each other a kiss and release the wedding doves to fly away to symbolize the beginning of a new life together. We also have two styles of beautifully decorated cages for you to display your doves in the church during your wedding. 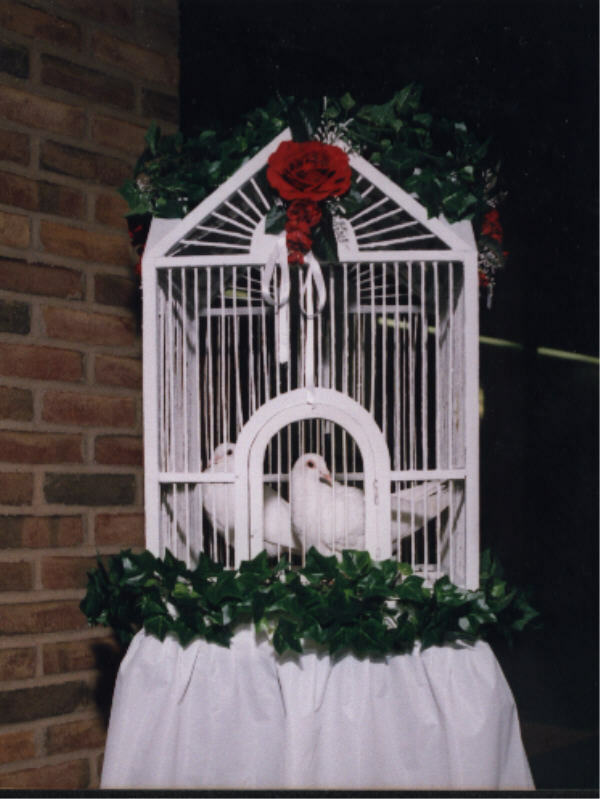 If you decide to use these cages we will bring them to the church one half hour prior to the wedding so that your photographer is able to get some memorable pictures. 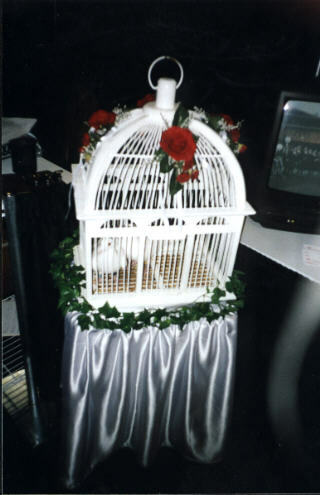 These cages are also available for garden weddings or virtually any celebration. Memorial birds: Releasing white doves at the funeral of a friend or loved one is a great remembrance for all to be hold. Release one dove to symbolize the spirit going to heaven or a whole flock to represent the awaiting angels. With few exceptions a dove release may be scheduled in any season. However we will not release our birds during a snow, hail, rain or excessive heat. Excessive wind will be decided the day of the wedding. A release may be scheduled anytime during daylight hours. Release time must allow birds ample time to return home safely before dark. Two birds -- Bride and Groom. Six birds --Bride, Groom, Parents, Attendants. Twelve birds -- Bride, Groom Parents Attendants Grandparents, kids. Twenty four -- Fifty birds -- Entire wedding party plus birds released around or behind you. A breath taking sight. Any number of birds may be used, it's your choice. Two bird display cages may accompany any release. If the decision not to personally hold the birds is made we have three different decorated baskets that can be used for releases. You only get one chance to to capture the moment. Attendant will accompany all releases,they can help position the release and direction to ensure the best possible effect and pictures. Attendant will also distribute the doves to the appropriate participant. Featured twice on local television. Did release for graduations and other special events. Did numerous releases for schools and charities. What happens to the doves after they are released? They are trained to fly back to their home. Where they are fed, watered and they are safe. Well trained healthy birds can fly up to 600 miles in one day. Most of the releases are within a 50 mile radius of their home. How late in the day can the doves be released? The distance of the release from home will determine the latest time possible for the release. The doves need enough time to safely arrive home before dark. We will not release the doves in bad weather: Rain,Snow,Wind or excessive heat. 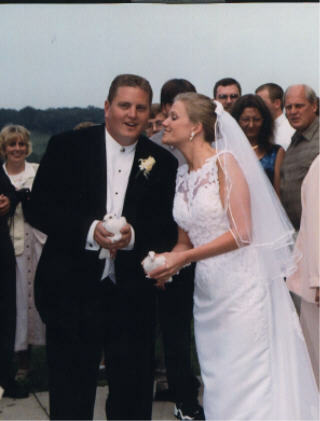 Dove releases are a unique and beautiful addition to your special day. White dove releases are a beautiful finishing touch. other Dove release return policy's! for 23 years. Hire a "Professional"
.THIS YOUR SPECIAL DAY DON'T TRUST IT TO A NON PROFESIONAL. who specialize in Hair and Make up? They bring the salon to you. For Hair information contact Tabitha at tabithaf@embarqmail.com or call 763-242-3116. For Make-up information contact Jennifer at JFredrichs3@gmail.com or call 612-384-1535.